This post is a short extraction from the CAD Trends in Manufacturing Report. 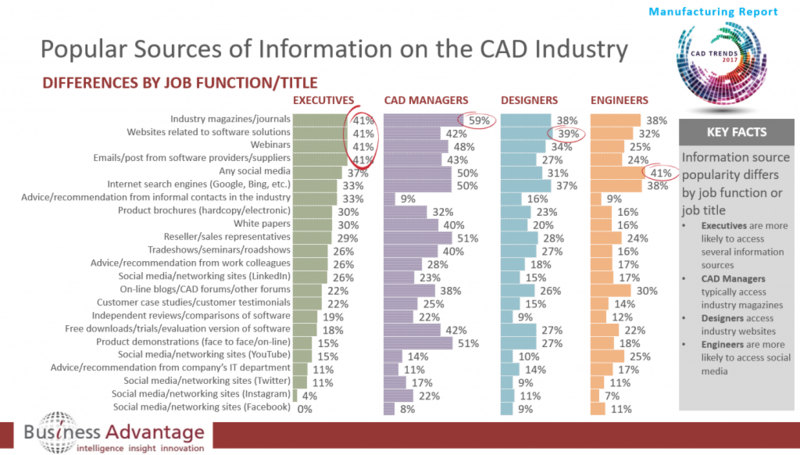 Decision makers’ and users’ preferred sources of CAD information is just one of 14 CAD Trends covered in the full report. For Architecture, Engineering and Construction (AEC) specialists, you can find the equivalent AEC market research report here. Of course, search engines are more a method of finding information rather than a source of information. However, their high usage emphasizes the huge importance of Search Engine Optimization (SEO) and Search Engine Marketing (SEM) for all suppliers of CAD systems, software and services. The above chart shows consolidated results by job function. Preferred media differs considerably by job title; therefore marketing campaigns to reach senior managers, CAD managers or engineers should each use different strategies. EMEA: search engines are the number one source of information and 85% use digital channels, 75% use traditional (non-digital) channels. Americas: webinars are the number one source of information, 84% use digital channels, 72% use traditional channels. APAC: social media is the number one source of information and 85% use digital channels, and 66% use traditional channels. 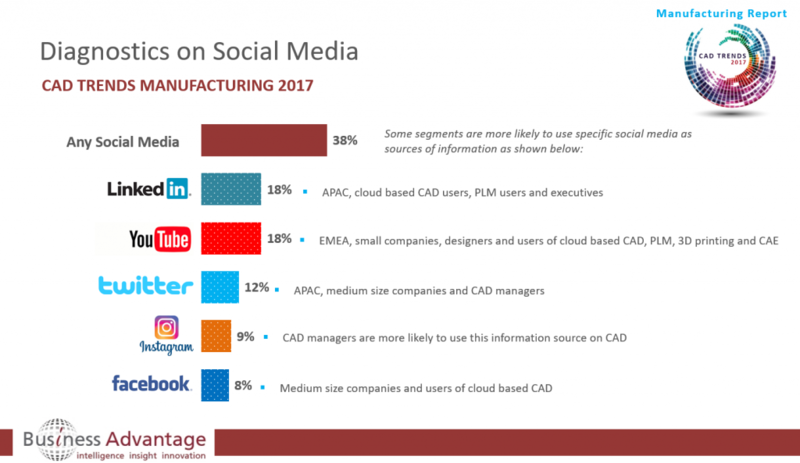 In order to most effectively use social media to target users and decision makers in the manufacturing sector, marketers should utilize LinkedIn and YouTube! 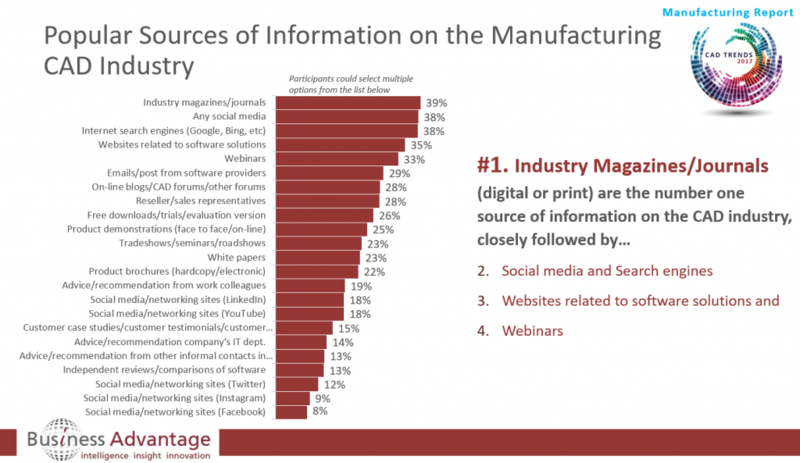 Small companies (up to 50 employees): social media (42%) and industry magazines/journals (42%) are the leading sources of information. Small companies are more likely to access social media and industry magazines. Medium sized companies (51-1,000 employees): social media (43%) is the leading source of information and search engines (38%) the second most important. Large companies (1,001+ employees): industry magazines/ journals (51%) are most important and websites related to software solutions (46%) are the second most important. 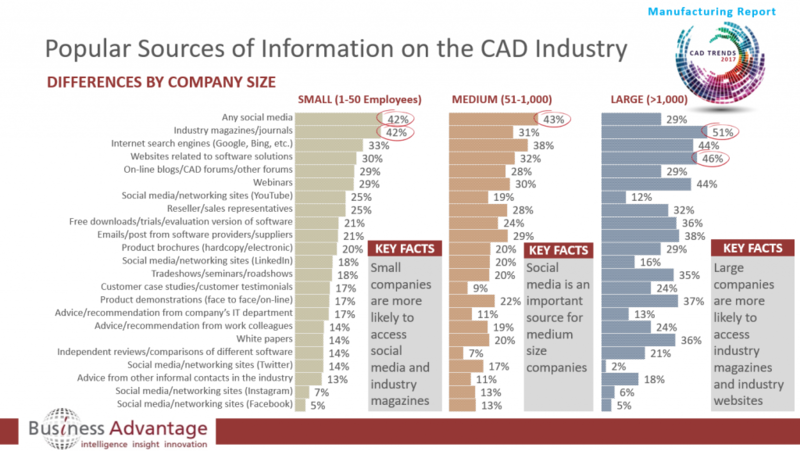 “For vendors it is obviously very important to know which sources of CAD information are preferred by different audiences so they can most effectively reach each target group.” – Chris Turner, CEO/Managing Director of The Business Advantage Group. 2. 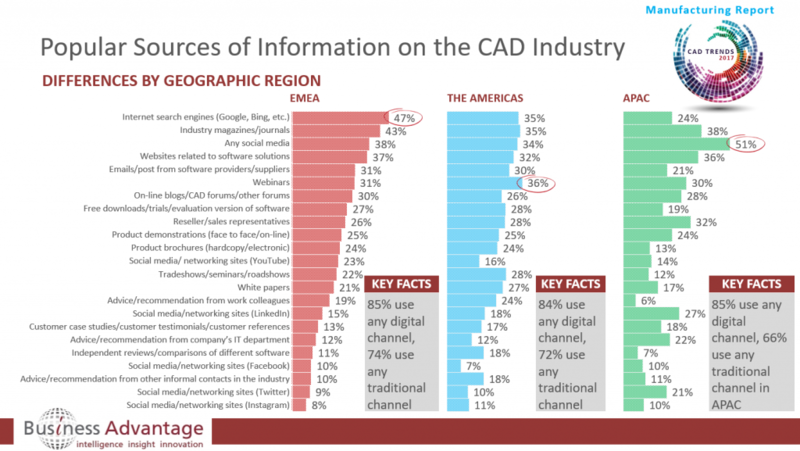 Subscribe to this blog for regular CAD Trend updates as we do new annual Worldwide CAD Trends Surveys. 3. If you are interested in specific analyses of the data give us a call to chat with a research executive about your needs.